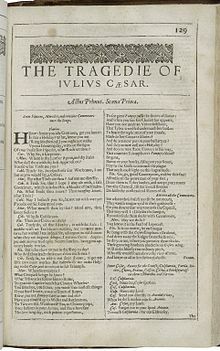 The Tragedy of Julius Caesar (First Folio title: The Tragedie of Iulius Cæsar) is a history play and tragedy by William Shakespeare, believed to have been written in 1599. It is one of several plays written by Shakespeare based on true events from Roman history, which also include Coriolanus and Antony and Cleopatra. Although the play is named Julius Caesar, Brutus speaks more than four times as many lines as the title character; and the central psychological drama of the play focuses on Brutus' struggle between the conflicting demands of honour, patriotism, and friendship. The play opens with two tribunes discovering the commoners of Rome celebrating Julius Caesar's triumphant return from defeating the sons of his military rival, Pompey. The tribunes, insulting the crowd for their change in loyalty from Pompey to Caesar, attempt to end the festivities and break up the commoners, who return the insults. During the feast of Lupercal, Caesar holds a victory parade and a soothsayer warns him to "Beware the ides of March", which he ignores. Meanwhile, Cassius attempts to convince Brutus to join his conspiracy to kill Caesar. Although Brutus, friendly towards Caesar, is hesitant to kill him, he agrees that Caesar may be abusing his power. They then hear from Casca that Mark Antony has offered Caesar the crown of Rome three times and that each time Caesar refused it with increasing reluctance, in hopes that the crowd watching the exchange would beg him to accept the crown, yet the crowd applauded Caesar for denying the crown, upsetting Caesar, due to his wanting to accept the crown. On the eve of the ides of March, the conspirators meet and reveal that they have forged letters of support from the Roman people to tempt Brutus into joining. Brutus reads the letters and, after much moral debate, decides to join the conspiracy, thinking that Caesar should be killed to prevent him from doing anything against the people of Rome if he were ever to be crowned. After ignoring the soothsayer, as well as his wife Calpurnia's own premonitions, Caesar goes to the Senate. The conspirators approach him with a fake petition pleading on behalf of Metellus Cimber's banished brother. As Caesar predictably rejects the petition, Casca and the others suddenly stab him; Brutus is last. At this point, Caesar utters the famous line "Et tu, Brute?" ("And you, Brutus? ", i.e. "You too, Brutus? "), concluding with "Then fall, Caesar!" The conspirators make clear that they committed this murder for the good of Rome, not for their own purposes, and do not attempt to flee the scene. Brutus delivers an oration defending his own actions, and for the moment, the crowd is on his side. However, Mark Antony makes a subtle and eloquent speech over Caesar's corpse, beginning with the much-quoted "Friends, Romans, countrymen, lend me your ears!" In this way, he deftly turns public opinion against the assassins by manipulating the emotions of the common people, in contrast to the rational tone of Brutus's speech, yet there is method in his rhetorical speech and gestures: he reminds them of the good Caesar had done for Rome, his sympathy with the poor, and his refusal of the crown at the Lupercal, thus questioning Brutus's claim of Caesar's ambition; he shows Caesar's bloody, lifeless body to the crowd to have them shed tears and gain sympathy for their fallen hero; and he reads Caesar's will, in which every Roman citizen would receive 75 drachmas. Antony, even as he states his intentions against it, rouses the mob to drive the conspirators from Rome. Amid the violence, an innocent poet, Cinna, is confused with the conspirator Lucius Cinna and is taken by the mob, which kills him for such "offenses" as his bad verses. At the battle, Cassius and Brutus, knowing that they will probably both die, smile their last smiles to each other and hold hands. During the battle, Cassius has his servant kill him after hearing of the capture of his best friend, Titinius. After Titinius, who was not really captured, sees Cassius's corpse, he commits suicide. However, Brutus wins that stage of the battle, but his victory is not conclusive. With a heavy heart, Brutus battles again the next day. He loses and commits suicide by running on his own sword, held for him by a loyal soldier. The play ends with a tribute to Brutus by Antony, who proclaims that Brutus has remained "the noblest Roman of them all" because he was the only conspirator who acted, in his mind, for the good of Rome. There is then a small hint at the friction between Mark Antony and Octavius which characterises another of Shakespeare's Roman plays, Antony and Cleopatra. The main source of the play is Thomas North's translation of Plutarch's Lives. Shakespeare makes Caesar's triumph take place on the day of Lupercalia (15 February) instead of six months earlier. For dramatic effect, he makes the Capitol the venue of Caesar's death rather than the Curia Pompeia (Curia of Pompey). Caesar's murder, the funeral, Antony's oration, the reading of the will and the arrival of Octavius all take place on the same day in the play. However, historically, the assassination took place on 15 March (The Ides of March), the will was published on 18 March, the funeral was on 20 March, and Octavius arrived only in May. Shakespeare makes the Triumvirs meet in Rome instead of near Bononia to avoid an additional locale. He combines the two Battles of Philippi although there was a 20-day interval between them. Shakespeare gives Caesar's last words as "Et tu, Brute? ("And you, Brutus?"). Plutarch and Suetonius each report that he said nothing, with Plutarch adding that he pulled his toga over his head when he saw Brutus among the conspirators, though Suetonius does record other reports that Caesar said in Greek "καὶ σὺ, τέκνον;" (Kai su, teknon?, "And you, child?") The Latin words Et tu, Brute?, however, were not devised by Shakespeare for this play since they are attributed to Caesar in earlier Elizabethan works and had become conventional by 1599. Shakespeare deviated from these historical facts to curtail time and compress the facts so that the play could be staged more easily. The tragic force is condensed into a few scenes for heightened effect. Julius Caesar was originally published in the First Folio of 1623, but a performance was mentioned by Thomas Platter the Younger in his diary in September 1599. The play is not mentioned in the list of Shakespeare's plays published by Francis Meres in 1598. Based on these two points, as well as a number of contemporary allusions, and the belief that the play is similar to Hamlet in vocabulary, and to Henry V and As You Like It in metre, scholars have suggested 1599 as a probable date. The text of Julius Caesar in the First Folio is the only authoritative text for the play. The Folio text is notable for its quality and consistency; scholars judge it to have been set into type from a theatrical prompt-book. The play contains many anachronistic elements from the Elizabethan era. The characters mention objects such as hats and doublets (large, heavy jackets) – neither of which existed in ancient Rome. Caesar is mentioned to be wearing an Elizabethan doublet instead of a Roman toga. At one point a clock is heard to strike and Brutus notes it with "Count the clock". Maria Wyke has written that the play reflects the general anxiety of Elizabethan England over succession of leadership. At the time of its creation and first performance, Queen Elizabeth, a strong ruler, was elderly and had refused to name a successor, leading to worries that a civil war similar to that of Rome might break out after her death. Critics of Shakespeare's play Julius Caesar differ greatly on their views of Caesar and Brutus. 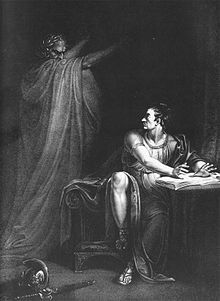 Many have debated whether Caesar or Brutus is the protagonist of the play, because of the title character's death in Act Three, Scene One. But Caesar compares himself to the Northern Star, and perhaps it would be foolish not to consider him as the axial character of the play, around whom the entire story turns. Intertwined in this debate is a smattering of philosophical and psychological ideologies on republicanism and monarchism. One author, Robert C. Reynolds, devotes attention to the names or epithets given to both Brutus and Caesar in his essay "Ironic Epithet in Julius Caesar". This author points out that Casca praises Brutus at face value, but then inadvertently compares him to a disreputable joke of a man by calling him an alchemist, "Oh, he sits high in all the people's hearts,/And that which would appear offence in us/ His countenance, like richest alchemy,/ Will change to virtue and to worthiness" (I.iii.158–60). Reynolds also talks about Caesar and his "Colossus" epithet, which he points out has its obvious connotations of power and manliness, but also lesser known connotations of an outward glorious front and inward chaos. Myron Taylor, in his essay "Shakespeare's Julius Caesar and the Irony of History", compares the logic and philosophies of Caesar and Brutus. Caesar is deemed an intuitive philosopher who is always right when he goes with his instinct, for instance when he says he fears Cassius as a threat to him before he is killed, his intuition is correct. Brutus is portrayed as a man similar to Caesar, but whose passions lead him to the wrong reasoning, which he realises in the end when he says in V.v.50–51, "Caesar, now be still:/ I kill'd not thee with half so good a will". Joseph W. Houppert acknowledges that some critics have tried to cast Caesar as the protagonist, but that ultimately Brutus is the driving force in the play and is therefore the tragic hero. Brutus attempts to put the republic over his personal relationship with Caesar and kills him. Brutus makes the political mistakes that bring down the republic that his ancestors created. He acts on his passions, does not gather enough evidence to make reasonable decisions and is manipulated by Cassius and the other conspirators. 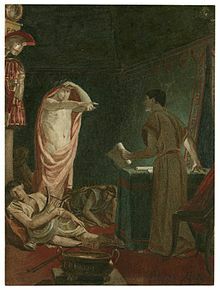 Traditional readings of the play may maintain that Cassius and the other conspirators are motivated largely by envy and ambition, whereas Brutus is motivated by the demands of honour and patriotism. Certainly, this is the view that Antony expresses in the final scene. But one of the central strengths of the play is that it resists categorising its characters as either simple heroes or villains. The political journalist and classicist Garry Wills maintains that "This play is distinctive because it has no villains". It is a drama famous for the difficulty of deciding which role to emphasise. The characters rotate around each other like the plates of a Calder mobile. Touch one and it affects the position of all the others. Raise one, another sinks. But they keep coming back into a precarious balance. Wills' contemporary interpretation leans more toward recognition of the conscious, sub-conscious nature of human actions and interactions. In this, the role of Cassius becomes paramount. After the theatres re-opened at the start of the Restoration era, the play was revived by Thomas Killigrew's King's Company in 1672. Charles Hart initially played Brutus, as did Thomas Betterton in later productions. Julius Caesar was one of the very few Shakespearean plays that was not adapted during the Restoration period or the eighteenth century. 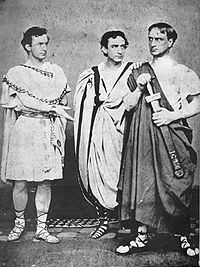 John Wilkes Booth (left), Edwin Booth and Junius Brutus Booth Jr. in Shakespeare's Julius Caesar in 1864. 1864: Junius Jr., Edwin and John Wilkes Booth (later the assassin of U.S. president Abraham Lincoln) made the only appearance onstage together in a benefit performance of Julius Caesar on 25 November 1864, at the Winter Garden Theater in New York City. Junius Jr. played Cassius, Edwin played Brutus and John Wilkes played Mark Antony. This landmark production raised funds to erect a statue of Shakespeare in Central Park, which remains to this day. 29 May 1916: A one-night performance in the natural bowl of Beachwood Canyon, Hollywood drew an audience of 40,000 and starred Tyrone Power Sr. and Douglas Fairbanks Sr. The student bodies of Hollywood and Fairfax High Schools played opposing armies, and the elaborate battle scenes were performed on a huge stage as well as the surrounding hillsides. The play commemorated the tercentenary of Shakespeare's death. A photograph of the elaborate stage and viewing stands can be seen on the Library of Congress website. The performance was lauded by L. Frank Baum. 1926: Another elaborate performance of the play was staged as a benefit for the Actors Fund of America at the Hollywood Bowl. Caesar arrived for the Lupercal in a chariot drawn by four white horses. The stage was the size of a city block and dominated by a central tower eighty feet in height. The event was mainly aimed at creating work for unemployed actors. Three hundred gladiators appeared in an arena scene not featured in Shakespeare's play; a similar number of girls danced as Caesar's captives; a total of three thousand soldiers took part in the battle sequences. 1950: John Gielgud played Cassius at the Shakespeare Memorial Theatre under the direction of Michael Langham and Anthony Quayle. The production was considered one of the highlights of a remarkable Stratford season and led to Gielgud (who had done little film work to that time) playing Cassius in Joseph L. Mankiewicz's 1953 film version. 1977: Gielgud made his final appearance in a Shakespearean role on stage as Caesar in John Schlesinger's production at the Royal National Theatre. The cast also included Ian Charleson as Octavius. 1994: Arvind Gaur directed the play in India with Jaimini Kumar as Brutus and Deepak Ochani as Caesar (24 shows); later on he revived it with Manu Rishi as Caesar and Vishnu Prasad as Brutus for the Shakespeare Drama Festival, Assam in 1998. Arvind Kumar translated Julius Caesar into Hindi. This production was also performed at the Prithvi international theatre festival, at the India Habitat Centre, New Delhi. 2005: Denzel Washington played Brutus in the first Broadway production of the play in over fifty years. The production received universally negative reviews but was a sell-out because of Washington's popularity at the box office. 2012: The Royal Shakespeare Company staged an all-black production under the direction of Gregory Doran. 2012: An all-female production starring Harriet Walter as Brutus and Frances Barber as Caesar was staged at the Donmar Warehouse, directed by Phyllida Lloyd. In October 2013, the production transferred to New York's St. Ann's Warehouse in Brooklyn. 2018: The Bridge Theatre stages Julius Caesar as one of its first productions, under the direction of Nicholas Hytner, with Ben Whishaw, Michelle Fairley, and David Morrissey as leads. This mirrors the play's status as one of the first productions at the Globe Theatre in 1599. 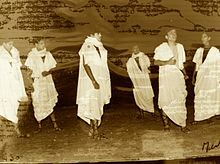 1963 production of Julius Caesar at The Doon School, India. One of the earliest cultural references to the play came in Shakespeare's own Hamlet. Prince Hamlet asks Polonius about his career as a thespian at university, Polonius replies "I did enact Julius Caesar. I was killed i' th' Capitol. Brutus killed me." This is a likely meta-reference, as Richard Burbage is generally accepted to have played leading men Brutus and Hamlet, and the older John Heminges to have played Caesar and Polonius. In 1851, the German composer Robert Schumann wrote a concert overture Julius Caesar, inspired by Shakespeare's play. Other musical settings include those by Giovanni Bononcini, Hans von Bülow, Felix Draeseke, Josef Bohuslav Foerster, John Ireland, John Foulds, Gian Francesco Malipiero, Manfred Gurlitt, Darius Milhaud, and Mario Castelnuovo-Tedesco. The Canadian comedy duo Wayne and Shuster parodied Julius Caesar in their 1958 sketch Rinse the Blood off My Toga. Flavius Maximus, Private Roman Eye, is hired by Brutus to investigate the death of Caesar. The police procedural combines Shakespeare, Dragnet, and vaudeville jokes and was first broadcast on The Ed Sullivan Show. In 1984, the Riverside Shakespeare Company of New York City produced a modern dress Julius Caesar set in contemporary Washington, called simply CAESAR!, starring Harold Scott as Brutus, Herman Petras as Caesar, Marya Lowry as Portia, Robert Walsh as Antony, and Michael Cook as Cassius, directed by W. Stuart McDowell at The Shakespeare Center. In 2006, Chris Taylor from the Australian comedy team The Chaser wrote a comedy musical called Dead Caesar which was shown at the Sydney Theatre Company in Sydney. A Buffy the Vampire Slayer novel. The 2008 movie Me and Orson Welles, based on a book of the same name by Robert Kaplow, is a fictional story centred around Orson Welles' famous 1937 production of Julius Caesar at the Mercury Theatre. British actor Christian McKay is cast as Welles, and co-stars with Zac Efron and Claire Danes. The 2012 Italian drama film Caesar Must Die (Italian: Cesare deve morire), directed by Paolo and Vittorio Taviani, follows convicts in their rehearsals ahead of a prison performance of Julius Caesar. In the Ray Bradbury book Fahrenheit 451, some of the character Beatty's last words are "There is no terror, Cassius, in your threats, for I am armed so strong in honesty that they pass me as an idle wind, which I respect not!" The play's line "the fault, dear Brutus, is not in our stars, but in ourselves", spoken by Cassius in Act I, scene 2, is often referenced in popular culture. The line gave its name to the J.M. Barrie play Dear Brutus, and also gave its name to the best selling young adult novel The Fault in Our Stars by John Green and its film adaptation. The same line was quoted in Edward R. Murrow's epilogue of his famous 1954 See It Now documentary broadcast concerning Senator Joseph R. McCarthy. This speech and the line were recreated in the 2005 film Good Night, and Good Luck. It was also quoted by George Clooney's character in the Coen brothers film Intolerable Cruelty. The line "And therefore think him as a serpent's egg / Which hatch'd, would, as his kind grow mischievous; And kill him in the shell." spoken by Brutus in Act II, Scene 1, is referenced in the Dead Kennedys song, "California Über Alles". The titles of Agatha Christie novel Taken At The Flood, titled There is a Tide in its American Edition, refer to an iconic line of Brutus: "There is a tide in the affairs of men, which, taken at the flood, leads on to fortune." (Act IV, Scene III). Julius Caesar (Vitagraph Company of America, 1908), produced by J. Stuart Blackton and directed by William V. Ranous, who also played Antony. Julius Caesar (Avon Productions, 1950), directed by David Bradley, who played Brutus; Charlton Heston played Antony and Harold Tasker played Caesar. Julius Caesar (MGM, 1953), directed by Joseph L. Mankiewicz and produced by John Houseman; starring James Mason as Brutus, Marlon Brando as Antony and Louis Calhern as Caesar. An Honourable Murder (1960), directed by Godfrey Grayson; depicted the play in a modern business setting. The Spread of the Eagle, a 1963 BBC series comprising Coriolanus, Julius Caesar, and Antony & Cleopatra. Julius Caesar (Commonwealth United, 1969), directed by Stuart Burge, produced by Peter Snell, starring Jason Robards as Brutus, Charlton Heston as Antony and John Gielgud as Caesar. Heil Caesar (BBC, 1973), a three-part television play written by John Griffith Bowen that was "a modern-dress modern-dialogue rewrite of the play, updated to an unnamed present-day regime that's about to switch from democracy to dictatorship unless Brutus and his conspirators act to prevent it." It was intended as an introduction to Shakespeare's play for schoolchildren, but it proved good enough to be shown on adult television, and a stage version was later produced. The British Universities Film & Video Council database states that the work "transforms the play into a modern political conspiracy thriller with modern dialogue and many strong allusions to political events in the early 1970." Julius Caesar (BBC/Time-Life TV, 1978), a television adaptation directed by Herbert Wise and produced by Cedric Messina, starring Richard Pasco as Brutus, Keith Michell as Antony and Charles Gray as Caesar. Zulfiqar (2016), a Bengali-language Indian film by Srijit Mukherji that is an adaption of both Julius Caesar and Antony and Cleopatra and a tribute to the film The Godfather. Modern adaptions of the play have often made contemporary political references, with Caesar depicted as resembling a variety of political leaders, including Huey Long, Margaret Thatcher, and Tony Blair. Professor A. J. Hartley, the Robinson Chair of Shakespeare Studies at the University of North Carolina at Charlotte, states that this is fairly "common trope" of Julius Caesar performances: "Throughout the 20th century and into the 21st, the rule has been to create a recognisable political world within the production. And often people in the title role itself look like or feel like somebody either in recent or current politics." A 2012 production of Julius Caesar by the Guthrie Theatre and The Acting Company "presented Caesar in the guise of a black actor who was meant to suggest President Obama." This production was not particularly controversial. In 2017, however, a modern adaptation of the play at New York's Shakespeare in the Park (performed by The Public Theater) depicted Caesar with the likeness of President Donald Trump and thereby aroused ferocious controversy, drawing criticism by right-wing media such as The Daily Caller and Breitbart and prompting corporate sponsors Bank of America and Delta Airlines to pull their financial support. The Public Theater stated that the message of the play is not pro-assassination and that the point is that "those who attempt to defend democracy by undemocratic means pay a terrible price and destroy the very thing they are fighting to save." Shakespeare scholars Stephen Greenblatt and Peter Holland agreed with this statement. 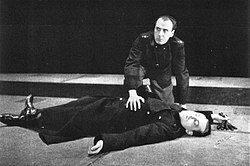 Pallotta stated that "I have never read anyone suggesting that 'Julius Caesar' is a play that recommends assassination. Look what happens: Caesar is assassinated to stop him becoming a dictator. Result: civil war, massive slaughter, creation of an emperor, execution of many who sympathized with the conspiracy. Doesn't look much like a successful result for the conspirators to me." The play was interrupted several times by right-wing protesters, who accused the play of "violence against the right", and actors and members of theatres with Shakespeare in the name has been harassed and received death threats, including the wife of the play's director Oskar Eustis. The protests were praised by American Family Association director Sandy Rios who compared the play with the execution of Christians by damnatio ad bestias. ^ Named in Parallel Lives and quoted in Spevack, Marvin (2004). Julius Caesar. New Cambridge Shakespeare (2 ed.). Cambridge, England: Cambridge University Press. p. 74. ISBN 978-0-521-53513-7. ^ Julius Caesar, Act 3, Scene 1, Line 77. ^ Julius Caesar, Act 3, Scene 2, Line 73. ^ Julius Caesar, Act 4, Scene 3, Lines 19–21. ^ Julius Caesar, Act 4, Scene 3, Line 283. ^ Julius Caesar, Act 5, Scene 5, Line 68. ^ Shakespeare, William (1999). Arthur Humphreys (ed.). Julius Caesar. Oxford University Press. p. 8. ISBN 0-19-283606-4. ^ Pages from Plutarch, Shakespeare's Source for Julius Caesar. ^ Wells and Dobson (2001, 229). ^ Wells and Dobson, ibid. ^ Wyke, Maria (2006). Julius Caesar in western culture. Oxford, England: Blackwell. p. 5. ISBN 978-1-4051-2599-4. ^ Wills, Garry (2011), Rome and Rhetoric: Shakespeare's Julius Caesar; New Haven and London: Yale University Press, p. 118. ^ Wills, Op. cit., pg 117. ^ [[G. Blakemore Evans|Evans, G. Blakemore]] (1974). The Riverside Shakespeare. Houghton Mifflin Co. p. 1100. ^ Richard Edes's Latin play Caesar Interfectus (1582?) would not qualify. The Admiral's Men had an anonymous Caesar and Pompey in their repertory in 1594–5, and another play, Caesar's Fall, or the Two Shapes, written by Thomas Dekker, Michael Drayton, Thomas Middleton, Anthony Munday, and John Webster, in 1601–2, too late for Platter's reference. Neither play has survived. The anonymous Caesar's Revenge dates to 1606, while George Chapman's Caesar and Pompey dates from ca. 1613. E. K. Chambers, Elizabethan Stage, Vol. 2, p. 179; Vol. 3, pp. 259, 309; Vol. 4, p. 4. ^ "Theatre: New Plays in Manhattan: Nov. 22, 1937". TIME. 22 November 1937. Retrieved 13 March 2010. ^ Lattanzio, Ryan (2014). "Orson Welles' World, and We're Just Living in It: A Conversation with Norman Lloyd". EatDrinkFilms.com. Retrieved 5 November 2015. ^ a b Welles, Orson; Bogdanovich, Peter; Rosenbaum, Jonathan (1992). 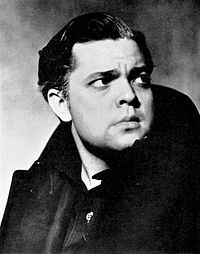 This is Orson Welles. New York: HarperCollins Publishers. ISBN 0-06-016616-9. ^ "News of the Stage; 'Julius Caesar' Closes Tonight". The New York Times. 28 May 1938. Retrieved 5 November 2015. ^ Callow, Simon (1996). Orson Welles: The Road to Xanadu. New York: Viking. ISBN 9780670867226. ^ "A Big-Name Brutus in a Caldron of Chaosa". The New York Times. 4 April 2005. Retrieved 7 November 2010. ^ "Rinse the Blood Off My Toga". Canadian Adaptations of Shakespeare Project at the University of Guelph. Retrieved 13 March 2010. ^ Herbert Mitgang of The New York Times, 14 March 1984, wrote: "The famous Mercury Theater production of Julius Caesar in modern dress staged by Orson Welles in 1937 was designed to make audiences think of Mussolini's Blackshirts – and it did. The Riverside Shakespeare Company's lively production makes you think of timeless ambition and antilibertarians anywhere." ^ Maria Wyke, Caesar in the USA (University of California Press, 2012), p. 60. ^ a b c d Shakespeare and the Moving Image: The Plays on Film and Television (eds. Anthony Davies & Stanley Wells: Cambridge University Press, 1994), pp. 29–31. ^ Darryll Grantley, Historical Dictionary of British Theatre: Early Period (Scarecrow Press, 2013), p. 228. ^ Stephen Chibnall & Brian McFarlane, The British 'B' Film (Palgrave Macmillan/British Film Institute, 2009), p. 252. ^ Michael Brooke. "Julius Caesar On Screen". Screenonline. British Film Institute. ^ Heil Caesar, Part 1: The Conspirators, Learning on Screen, British Universities Film & Video Council. ^ Anindita Acharya, My film Zulfiqar is a tribute to The Godfather, says Srijit Mukherji, Hindustan Times (20 September 2016). ^ a b c d Peter Marks, When 'Julius Caesar' was given a Trumpian makeover, people lost it. But is it any good, Washington Post (16 June 2017). ^ a b c d Frank Pallotta, Trump-like 'Julius Caesar' isn't the first time the play has killed a contemporary politician, CNN (12 June 2017). ^ "Delta and Bank of America boycott 'Julius Caesar' play starring Trump-like character". The Guardian. 12 June 2017. Retrieved 17 June 2017. ^ Alexander, Harriet (12 June 2017). "Central Park play depicting Julius Caesar as Donald Trump causes theatre sponsors to withdraw". The Telegraph. Retrieved 17 June 2017. ^ "Delta, BofA Drop Support For 'Julius Caesar' That Looks Too Much Like Trump". NPR. 12 June 2017. ^ Beckett, Lois (12 June 2017). "Trump as Julius Caesar: anger over play misses Shakespeare's point, says scholar". The Guardian. Retrieved 17 June 2017. ^ Al-Sibai, Noor (17 June 2017). "Shakespearean actors across the US are receiving death threats over New York's Trump-as-Caesar play". The Raw Story. Retrieved 23 June 2017. ^ "'Trump death' in Julius Caesar prompts threats to wrong theatres". CNN. 19 June 2017. Retrieved 23 June 2017. ^ Wahlquist, Calla (17 June 2017). "'This is violence against Donald Trump': rightwingers interrupt Julius Caesar play". The Guardian. Retrieved 23 June 2017. ^ Link, Taylor (22 June 2017). "Cops investigate death threats made against "Caesar" director's wife". Salon. Retrieved 23 June 2017. ^ Mantyla, Kyle (20 June 2017). "Sandy Rios Sees No Difference Between Shakespeare And Feeding Christians To The Lions". Right Wing Watch. Retrieved 23 June 2017. Boyce, Charles. 1990. Encyclopaedia of Shakespeare, New York, Roundtable Press. Chambers, Edmund Kerchever. 1923. The Elizabethan Stage. 4 volumes, Oxford: Oxford University Press. ISBN 0-19-811511-3. Halliday, F. E. 1964. A Shakespeare Companion 1564–1964. Shakespeare Library ser. Baltimore, Penguin, 1969. ISBN 0-14-053011-8. Houppert, Joseph W. "Fatal Logic in 'Julius Caesar'". South Atlantic Bulletin. Vol. 39, No.4. Nov. 1974. 3–9. Kahn, Coppelia. "Passions of some difference": Friendship and Emulation in Julius Caesar. Julius Caesar: New Critical Essays. Horst Zander, ed. New York: Routledge, 2005. 271–283. Parker, Barbara L. "The Whore of Babylon and Shakespeares's Julius Caesar." Studies in English Literature (Rice); Spring95, Vol. 35 Issue 2, p. 251, 19p. Reynolds, Robert C. "Ironic Epithet in Julius Caesar". Shakespeare Quarterly. Vol. 24. No.3. 1973. 329–333. Taylor, Myron. "Shakespeare's Julius Caesar and the Irony of History". Shakespeare Quarterly. Vol. 24, No. 3. 1973. 301–308. Wikimedia Commons has media related to Julius Caesar (play). Julius Caesar Navigator Includes Shakespeare's text with notes, line numbers, and a search function. No Fear Shakespeare Includes the play line by line with interpretation. Julius Caesar – Searchable and scene-indexed version. Quicksilver Radio Theater adaptation of Julius Caesar, which may be heard online, at PRX.org (Public Radio Exchange). Julius Caesar Read Online in Flash version. Clear Shakespeare Julius Caesar—A word-by-word audio guide through the play.